Why these emigrants and what do we know of them? First of all let me show you the location of Dorfprozelten, an ancient village situated on the River Main and formerly part of the Kingdom of Bavaria. 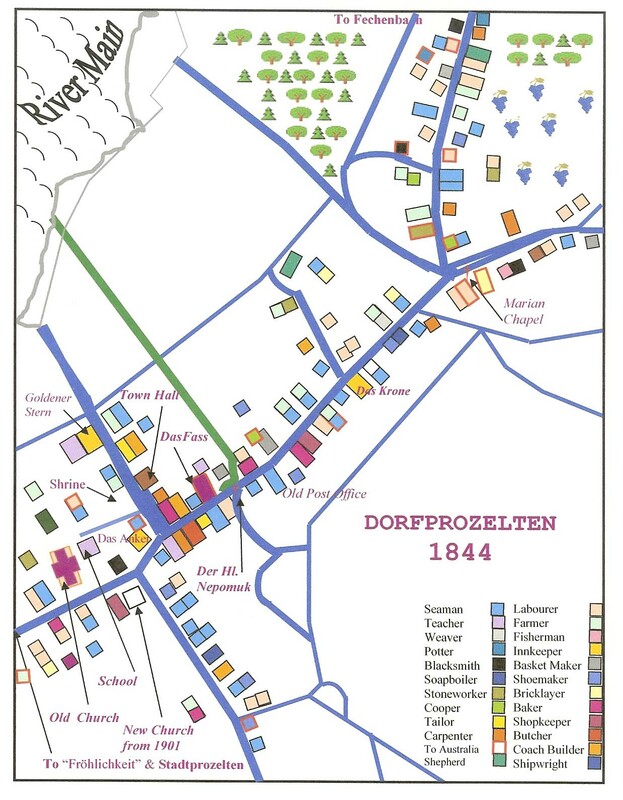 Georg Veh’s book Dorfprozelten Teil II is my “bible” for Dorfprozelten research with its rich detail of the families who lived in the village with a focus on 1844. My German wasn’t up to fully understanding quite what happened in 1844 but it seemed to me that perhaps it was a census. As it happens I wasn’t quite right, but it serves much the same purpose.I asked my German-speaking friend to clarify the origins of the map and the residence of the people in 1844, the focus of the book. My heavily-lagged copy of the book. In 1844 the first land register was conducted. It included the houses, land parcels, house numbers, names of owners or tenants as well as the businesses. On page 10 of the book there is a copy of the map on which this survey is based. It is quite “dense” with lots of markings and I wanted to simplify it and get some idea of whether people were clustered based on occupation as well as how close together the emigrants lived. Even though Dorfprozelten is a small village, it seemed useful to have some understanding of this. On this mudmap I’ve given each occupation a different colour as per the code on the bottom right. Houses from which the emigrants came are outlined with an ochre-coloured box. By the way, it is worth noting that the current church is not the one which existed when our ancestors lived there, however the beautiful stone christening font dates back to 1625. I hope you find it useful to understand the lie of the land, so to speak. Dorfprozelten am Main Teil II. Veh, G, Benedict Press, 2002 (this is my “bible” for historical research on Dorfprozelten around the time the emigrants came to Australia). 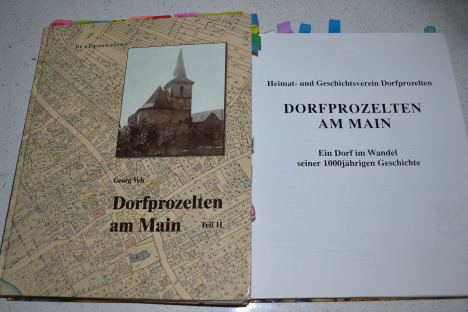 Also see: Dorfprozelten am Main: Ein Dorf im Wandel seiner 1000Jährigen Geschichte. Veh, G, Benedict Press 1995.